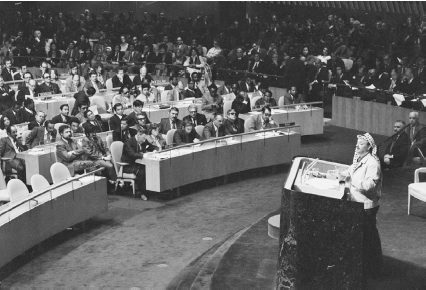 Yasser Arafat, PLO leader, explains the goals of Palestinians to the United Nations (13 Nov 1974). Article 5: The Palestinians are those Arab nationals who, until 1947, normally resided in Palestine regardless of whether they were evicted from it or have stayed there. Anyone born, after that date, of a Palestinian father – whether inside Palestine or outside it – is also a Palestinian. Article 8: The phase in their history, through which the Palestinian people are now living, is that of national (watani) struggle for the liberation of Palestine. Thus the conflicts among the Palestinian national forces are secondary, and should be ended for the sake of the basic conflict that exists between the forces of Zionism and of imperialism on the one hand, and the Palestinian Arab people on the other. On this basis the Palestinian masses, regardless of whether they are residing in the national homeland or in diaspora (mahajir) constitute – both their organizations and the individuals – one national front working for the retrieval of Palestine and its liberation through armed struggle. Article 9: Armed struggle is the only way to liberate Palestine. This it is the overall strategy, not merely a tactical phase. The Palestinian Arab people assert their absolute determination and firm resolution to continue their armed struggle and to work for an armed popular revolution for the liberation of their country and their return to it . They also assert their right to normal life in Palestine and to exercise their right to self-determination and sovereignty over it. Article 14: The destiny of the Arab nation, and indeed Arab existence itself, depend upon the destiny of the Palestine cause. From this interdependence springs the Arab nation’s pursuit of, and striving for, the liberation of Palestine. The people of Palestine play the role of the vanguard in the realization of this sacred (qawmi) goal. Article 15: The liberation of Palestine, from an Arab viewpoint, is a national (qawmi) duty and it attempts to repel the Zionist and imperialist aggression against the Arab homeland, and aims at the elimination of Zionism in Palestine. Absolute responsibility for this falls upon the Arab nation – peoples and governments – with the Arab people of Palestine in the vanguard. Accordingly, the Arab nation must mobilize all its military, human, moral, and spiritual capabilities to participate actively with the Palestinian people in the liberation of Palestine. It must, particularly in the phase of the armed Palestinian revolution, offer and furnish the Palestinian people with all possible help, and material and human support, and make available to them the means and opportunities that will enable them to continue to carry out their leading role in the armed revolution, until they liberate their homeland. Article 16: The liberation of Palestine, from a spiritual point of view, will provide the Holy Land with an atmosphere of safety and tranquility, which in turn will safeguard the country’s religious sanctuaries and guarantee freedom of worship and of visit to all, without discrimination of race, color, language, or religion. Accordingly, the people of Palestine look to all spiritual forces in the world for support. Article 26: The Palestine Liberation Organization, representative of the Palestinian revolutionary forces, is responsible for the Palestinian Arab people’s movement in its struggle – to retrieve its homeland, liberate and return to it and exercise the right to self-determination in it – in all military, political, and financial fields and also for whatever may be required by the Palestine case on the inter-Arab and international levels. 1 Hanukoglu, Israel, editor. “Palestinian National Covenant (Charter).” Israel Science and Technology Directory, Israel Science and Technology, http://www.science.co.il/arab-israeli-conflict/palestinian-covenant.asp. 2 English rendition by Leila S. Kadi, editor, as published in Basic Political Documents of the Armed Palestinian Resistance Movement. Palestine Research Centre, Beirut. December 1969, pp.137-141.